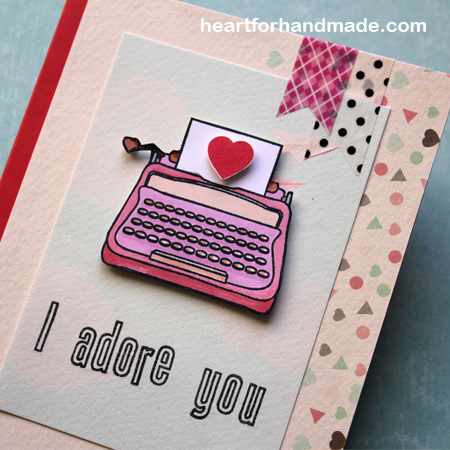 I’ve been wanting to have a typewriter stamp in the past so when Sarah Hurley has release this new Be Mine stamp set I ordered them right away from her. I colored them with promarker then fuzzy cut them. 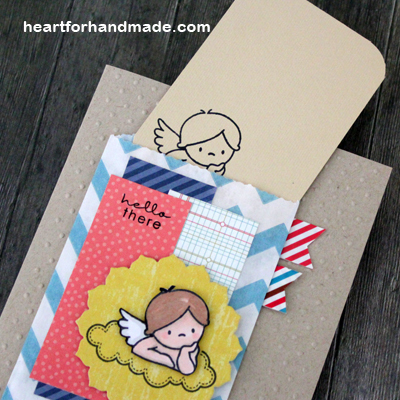 I used the card sketch in today’s project from Seize the Sketch # 16. 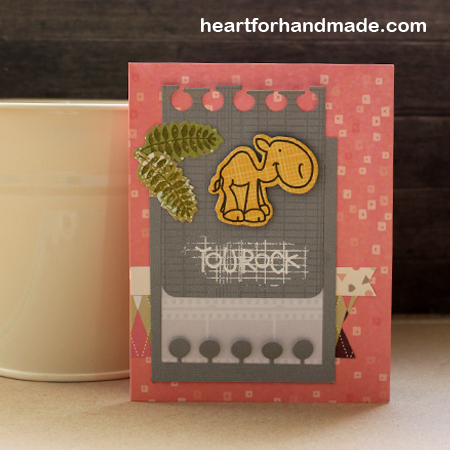 I created the sentiment from Sarah Hurley’s Outline Alpha stamp set. All the papers I used are all from Sarah’s Be Mine scrapbooking kit and Journaling card. I fuzzy cut the heart from the Be Mine kit as well. I added a foam square to pop them in the page. 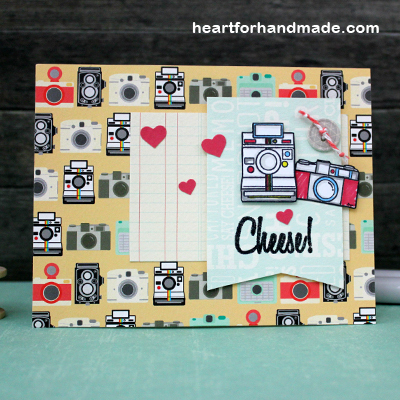 I’m also entering this card to Charisma Cardz Clean & Simple card challenge. It’s my first time to take the challenge at Deconstructed sketch. I’m joining this week in Deconstructed sketch # 142. I love doing card sketches as it gives you a starting point in doing your project. You can mix and match papers, stamps and just whatever you have on hand. The zigzag pocket bag is from Whisker Graphics. It’s been lying in my crafting table for some time but so glad I’m able to use it in this card. I added an extra note card inside for some notes. The banner is tab is from two different washi tapes that I have on stash. Love their diagonal colors too. 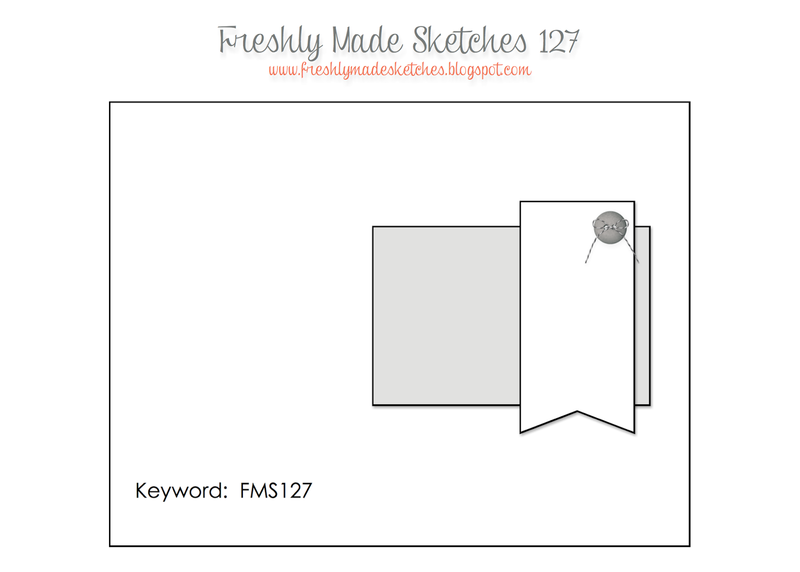 A quick post to show my take in Freshly Made Sketches # 127. I haven’t played around this sketch challenge for a while so its nice to take part this week. I used the papers from Sarah Hurley’s 8×8 paper and my favorite stamps also from Sarah Hurley. Love this set 🙂 I colored the cameras with promarkers and punched some hearts to add some colors. I made a card today with my Dad’s birthday in mind. 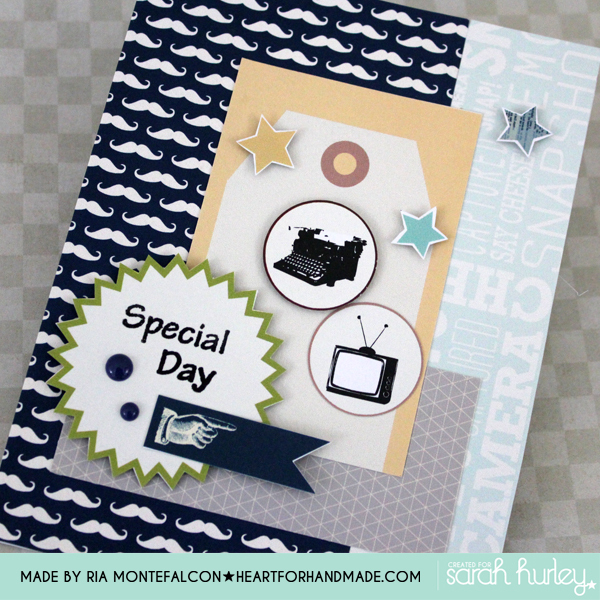 I used Sarah Hurley’s A Few of my Favorite Things kit Curio and City Gents to make this card. The sentiment is from the Sentiment stamp set. Can you remember the days when manual typewriter and the CRT TV monitors are the usual household items? I think Dad will remember back the days seeing this card 😉 For sure we still have the typewriter somewhere in our home as Mom keeps these things as memorabilia. 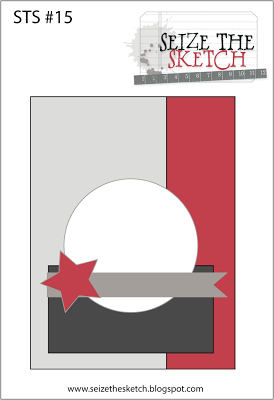 I’m entering this card in Seize the Sketch # 15. I replaced the circle with the tag instead and added the elements on it. I’m entering the same in Simon Says Stamp Wednesday challenge, Tag It challenge. It’s the 5th day of the month, that means a new challenge at Sarah Hurley 365 blog. This month’s challenge theme is “Speech Bubbles”. 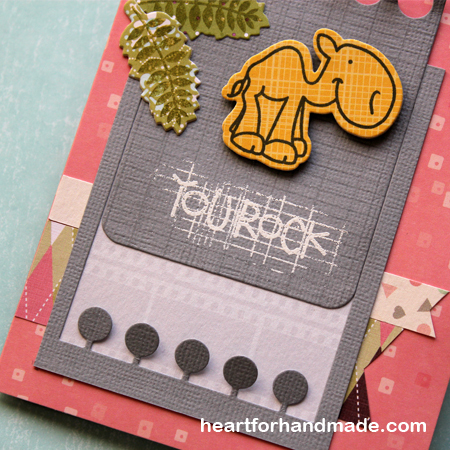 For my take, I used the printed speech tab and the speech bubble stamp from A Few of my Favorite Things February East Village kit. The kit includes two speech bubbles but here I used the straight lined one. 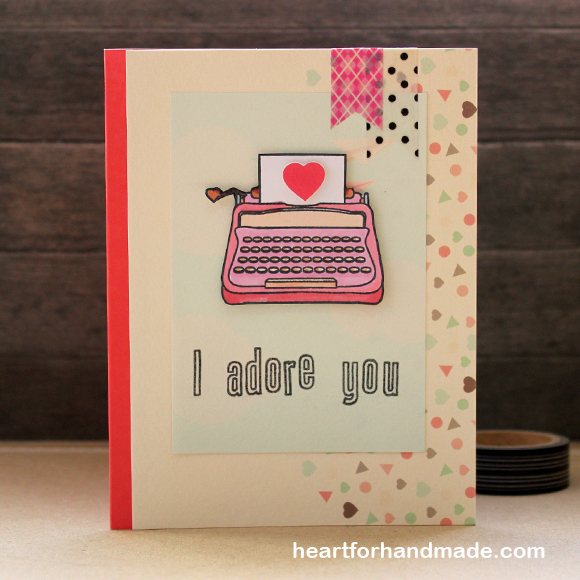 I then stamped the Sentiment using the Outline Alpha stamps (love this set too). I just added some scribbled lines in the word “happy” for some texture and fun. The orange patch stamp is from the Doodle Doll Art Girl stamps. 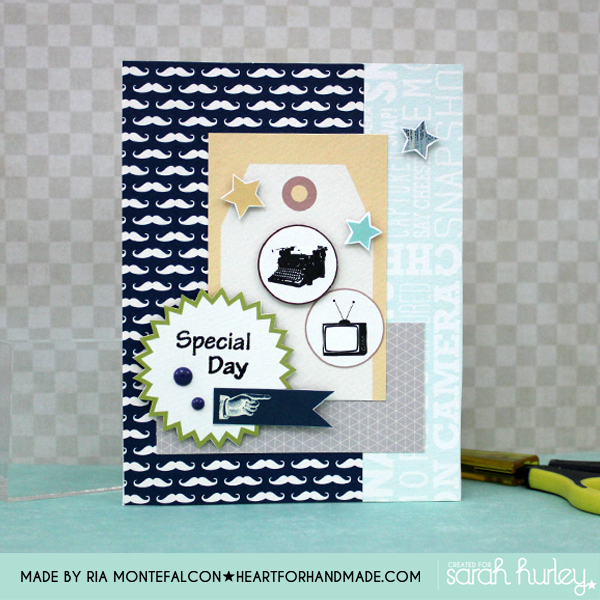 All the papers are from Sarah’s AFOMFT May Caught on Camera kit. I embossed the background for some additional texture too. A graphic kind of design fit for a masculine card isn’t it? I’m entering this card in Seize the Birthday, Anything Goes Birthday challenge. 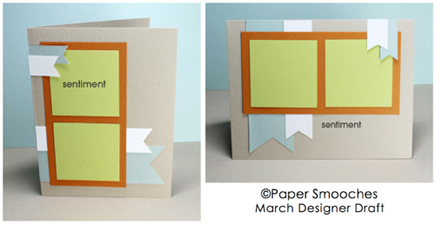 Also entering in Scrap It Girl, March Challenge – Birthday’s.